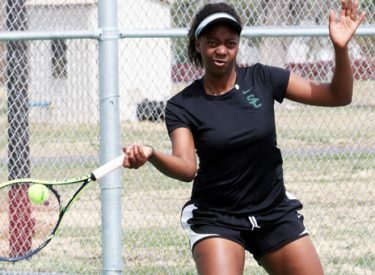 As expected, a successful day two on the courts at the NJCAA National Tournament in Tucson, Arizona has rocketed the Seward County Lady Saints up the leaderboard at the championships, as the gals in green move from 15th to 3rd at the end of two days of action with a 10-1 day Monday. In #1 singles it was an all Jayhawk Conference matchup in the second round as Seward’s Thalita Rodrigues took on Barton’s Neus Torregrosa. Rodrigues held on for a 6-4 win in the opening set before settling in for a 6-3 win in the second round to push her through to the quarters. In the quarterfinal round on Tuesday, Rodrigues will take on Abraham Baldwin’s Celia Morel, the 4th ranked player in the country. Sarah Manseri continued her stellar freshman campaign on Monday, sweeping past Margaret Blackwell of Central Alabama 6-3, 6-2 in straight sets to earn her way to the round of eight. Manseri will take on Juliette Mary of Eastern Arizona on Tuesday with a ticket to the final four in #2 singles on the line. Another Seward/Barton collision happened in the #3 draw where the Lady Saints Lisa Suzuki took on the Cougars Juliana Seabra in the second round. Suzuki had no trouble with Seabra, bouncing her with a dominating 6-1, 6-0 win to move onto the quarterfinals. Tuesday Suzuki will take on 35th ranked Kokoro Chishaki of St. Petersburg with a spot in the semis in the balance. Steffany Bermudez held seed Monday at #4 singles, putting matching 6-2 scores up against Paradise Valley’s Erica Wolford in the second round. Bermudez now advances to the quarterfinals where she will take on Seminole State’s Carla Lachasseigne Tuesday. The second round matchup at #5 was a rematch of the Region VI Championship from two weeks ago with Seward’s Martina Borges tangling with Cowley’s Kasey Coker. The match went eerily similar to the Region Title bout as Coker took the first 6-4 (won 7-5 in Great Bend) and then Borges stormed back for 6-2, 6-1 wins in the next two sets (won 6-1, 6-2 in Great Bend) for the come from behind victory. She advances to the quarters where she will take on Kaeli Smashley of Broward Tuesday morning. Seward’s only loss came at #6 where Rebecca Lin from Marion Military upset Fernanda Santana in straight sets. Santana then bounced back with a pair of easy wins to collect a point for the Lady Saints in the consolation bracket. At #2 doubles, Rodrigues and Suzuki continued to play some of their best tennis of the year, putting up their second straight 6-0, 6-0 score against DuPage to advance onto the quarters to battle top ranked Tyler Tuesday afternoon. Manseri and Bermudez teamed at #2 for a second round win on Monday, disposing of Barton 6-2, 6-2 to clinch their spot in the round of eight where they will take on Meridian Tuesday afternoon with a spot in the final four on the line. Tadi Mrewa and Madison Hoelting continued their run as one of the most successful Seward pairs in program history, taking a 6-3, 6-1 decision against Marion Military at #3 doubles to move to the quarterfinals for the second straight year where they will take on Broward on Tuesday. Seward pushes all the way up to #3 in the standings at the end of day two with 25.5 points, trailing just ASA Miami and Tyler who are tied atop the leaderboard with 27.